What Can LANAP® Offer Patients? Did you know that only 3 percent of adults with gum disease will agree to accept treatment? This is mainly due to fear of conventional methods, which involves the use of scalpels to incise and remove diseased tissue. However, this method is no longer the only option for treating gum disease. We have invested in the training and technology to offer the LANAP® laser protocol, which can effectively treat gum disease and regenerate new bone and tissue growth through the use of minimally invasive dental laser technology. If you have moderate to severe gum disease, you are most likely a candidate for LANAP® and will not need to receive conventional scalpel surgery to treat your condition. Due to the gentle nature of dental lasers, the LANAP® procedure does not remove any healthy gum tissue during treatment, so gum recession or loss of healthy tissue is less likely to occur. Overall, LANAP® can offer patients a much more comfortable treatment experience and healing period, with minimal post-operative pain, swelling, or bleeding! Our Scarborough, ON team is trained and certified to offer LANAP® and have many years of experience helping our patients with gum disease improve the health of their smiles. The LANAP® treatment process in our Scarborough, ON office can be completed in around 1-2 hours. Unlike a scalpel, the PerioLase MVP-7™ laser light is about the thickness of three hairs, which is used to clear away bacteria and infection between the teeth and gums. 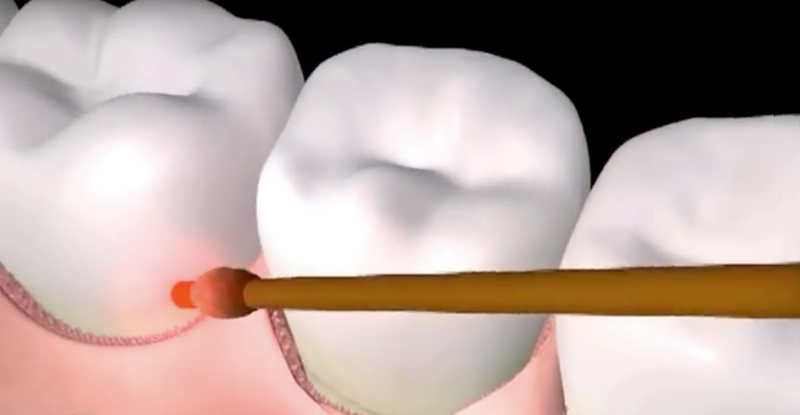 Once the teeth are cleaned of all plaque and tartar buildup, the laser is used to cauterize the treatment site and seal the periodontal pocket. All of this is accomplished without using scalpels or incising the gum tissue. During the healing period afterLANAP® surgery, the gums and bone will regenerate new tissue, helping create a healthier and more stable oral environment! Seek Scalpel-Free Gum Disease Treatment Today!